It's been a long time since I had my own housewarming....however have been to many of my friends and neighbours celebrations. What do you take to a housewarming... something to decorate the house or something for the kitchen, the pantry, the wine rack or cocktail cabinet? What I like to do is to give them one of my delicious delights with the accompanying recipe of course! 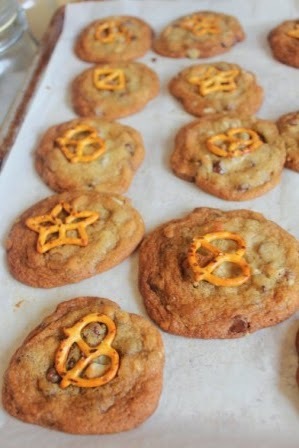 One of the most popular is my Choc Chip, Pecan and Pretzel cookies....they never fail to please. Hope you enjoy them too. Sift flour, bicarbonate soda and salt in a bowl. Using an electric mixer beat butter in a bowl on medium speed for 1 minute until smooth and creamy. Add caster sugar, brown sugar and vanilla extract and beat on medium high speed until pale and fluffy. Add eggs, one at time, beating after each addition until combined. On low speed, add flour mixture and mix until just combined. Stir in choc chips and nuts. Place heaped tablespoons of cookie dough, approximately 4cm apart, onto prepared trays, press down slightly. Carefully press pretzel into cookie. Bake, in batches, for 10-12 minutes or until golden brown, swapping trays halfway. Allow to cool on trays for 10 minutes. Using a spatula transfer to wire racks to cool completely. Use milk or white choc chips instead of dark. Swap pecan halves for chopped roasted macadamia nuts or even cornflakes or rice bubbles. Substitute half the butter for peanut butter. Reduce the salt to 1/2 teaspoon and reduce the sugars to only 1/2 cup each. Make these into 'Choc Chip, Pecan & Oat Cookie Bars'. Lightly grease and line a 38 x 25cm slice (jelly roll) pan with non-stick baking paper. Omit the pretzels. Reduce choc chips to 1 cup. Add 1 cup oats with the choc chips and nuts. Prepare the cookie dough as above up to end step 4. Spread dough evenly into prepared pan, level top. Bake for 20 to 25 minutes or until golden brown. Cool in pan on a wire rack. Transfer to a chopping board then cut into bars. This was my post for this month's #LetsLunch, a monthly Twitter based food blogger's virtual lunch club. If you'd like to join the LetsLunch group, go to Twitter and post a message with the hashtag #LetsLunch or post a comment below! For more housewarming favourites from the #letslunch blogger crew click on the links below. I'll continue to update them as they come in. This month’s #letslunch theme of your favourite stew was both easy and hard. 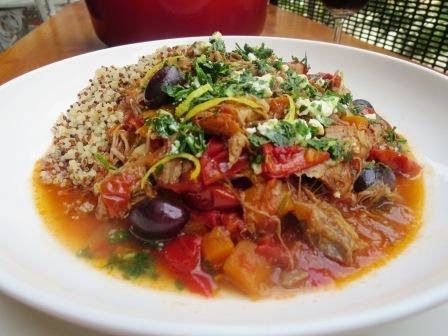 Easy...because selecting my favourite stew was a no brainer...my slow cooked lamb ragu. It’s my go-to dish when I want something heartwarming and comforting, full of flavour and the lamb just falls off the bone and melts in your mouth. Perfect tossed through some freshly cooked pappardelle or served with quinoa, rice or barley. It’s my base recipe that I easily create into new dishes. Well its summer over here in Sydney and it can get over 35C at my place and as I don't have air conditioning cooking with gas kicks up the heat to well over 40C.... turning my kitchen and lounge room into a sauna.....but hey I've got to stick with it ....aah what we do for the love of eating and writing about food!. So if it's winter at your place.....this is perfect....but if your 'melting' like me....save it for a few months time! Preheat oven to 170C (150C fan forced). Using a sharp knife carefully cut the lamb shank from the shoulder. Heat oil in a large flameproof cast iron casserole dish over medium high heat. Cook lamb shoulder and shank for 2-3 minutes each side until well browned. Remove and set aside. Reduce heat to medium. Add onion, carrot and capsicum to pan. Cook for 10 minutes, stirring occasionally or until softened. Add garlic and cook, stirring, for a further 2 minutes.Stir in stock to deglaze the pan, getting all those yummy bits from the base of the pan. Return lamb shoulder and shank. Add cherry tomatoes, oregano and rosemary. Season with salt and pepper. Bring to a rolling simmer. Cover the surface with baking paper then cover with lid. Cook in preheated oven for 3 hours or until lamb is tender and almost falling off the bone. Remove baking paper and discard. Stir through olives. Return to oven. Cook, uncovered, for a further 30 minutes. Place quinoa into a saucepan. Add 3 cups water. Bring to the boil. Reduce heat to low, cover and cook for 10 minutes. Set aside for 5 minutes. Meanwhile make gremolata by placing parsley and garlic into food processor . Pulse until finely chopped. Transfer to a bowl, stir through lemon zest, and olive oil and feta. Remove casserole from oven and skim off excess fat. Carefully transfer lamb from pan onto a large chopping board. Using 2 forks, roughly shred lamb, discarding bones and any fat. Return lamb back to pan, stir until combined. Season to taste with salt and pepper, if needed. Sprinkle with gremolata and serve with quinoa. Increase to 2 carrots and add 1 large celery stalk, chopped. Omit cherry tomatoes and use 1 litre chicken stock instead of beef stock and add 1/2 cup pearl barley. Omit olives and add chopped desiree (red) potatoes in the last 40 minutes. Stir in some chopped spinach leaves, just before serving. Add 2 teaspoons ground cumin, 1 teaspoon ground coriander, 1/4 teaspoon ground turmeric, 1 cinnamon stick and good pinch saffron. Ad some chopped preserved lemon, 1 cup Turkish dried apricots or prunes or pitted dates in with some green olives (instead of the kalamatta) and just garnish with coriander (cilantro) and serve with some greek yoghurt and couscous. Omit the fresh herbs. Add 2 teaspoon ground cumin and 1 teaspoon sweet paprika in with the onion. Instead of cherry tomatoes use 1 x 700ml bottle tomato passata and add 2 roughly chopped chipotle chillies in adobo sauce and 1 tablespoon adobo sauce. Add 1 teaspoon dried oregano in with the tomatoes. Instead of olives add a can drained rinsed kidney beans . Garnish with coriander ( cilantro) and freshly cooked corn kernels. Serve with sour cream, lime wedges and rice or chargrilled tortillas. Omit the capsicum. Add 2 chopped long green chillies, 2 chopped chorizo sausages and 100g chopped speck with the onions. Instead of cherry tomatoes use 1 x 700ml bottle of tomato passata. Omit rosemary and oregano and add 2 bay leaves and half bunch chopped coriander (cilantro). Omit the olives and add a can drained, rinsed black beans. Finish with some fresh lime juice and garnish with segmented oranges and extra coriander leaves (cilantro). 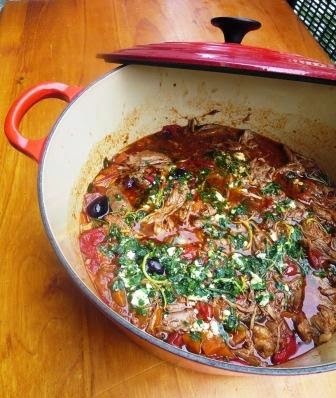 For more slow cooked recipe favourites from the #letslunch blogger crew click on the links below. I'll continue to update them as they come in. Down here in Australia, December is summer and sunshine, with many of Aussies spending their time by the beach, the pool or the air conditioning! However all of my teenage and university Christmas holidays were spent working on our farm in the north west of NSW. Sometimes it was a family affair, sometimes it was just my dad and me. When it was just the two us, dad created a little rule that of we had to 'live off the land’...no shop bought meat or poultry allowed. I only agreed if I was allowed whatever vegetables, spices, herbs and condiments I desired....well at least what I could buy from the general store. Although our farm is a sheep property, as with many farms in Australia, it also abounded with wild kangaroo, boar and rabbit....though never came across a bush turkey! Being an inquisitive foodie eating game is heaven and I used dad's rule as a license to experiment, exploring a new cuisine or flavour combination to create something new with our bounty. But it wasn’t always me hogging the kitchen....Dad would also don the apron, and on those hot December evenings it would often involve him cooking up a storm on the open woodfired brick barbecue he'd built. Barbecued rabbit was a traditional staple for Dad. I'd watch him cook it on a wire rack over slow burning logs, regularly turning it to keep the moisture evenly within the meat or sometimes throwing a little of his beer on it or placing some of the local grasses into the fire give it a herbaceous note. I miss Dad’s fired delights......I haven’t had barbecued rabbit for a while.....it’s been 10 years and 10 days since I said my eternal goodbye. So this little recipe is a tribute to our tradition of ‘living off the land’ in December.....and my ever continual desire to create something new. To make marinade, combine all the ingredients in a large bowl. Season to taste with salt and pepper. Measure out 1 1/3 cups of the marinade and set aside. Add rabbit to remaining marinade, in the bowl, to coat. Cover and refrigerate for 1 hour. Meanwhile transfer reserved marinade to a small saucepan. Bring to the boil. Reduce heat to low and cook, stirring occasionally, for 10 minutes or until reduced by half. Transfer the glaze to a heatproof jug and set aside to cool. Roll the pomegranate a little on the bench (this helps loosen the seeds). Cut pomegranate in half, then turn seed side down and hold over a bowl. Tap the skin with a large cook spoon or wooden spoon to release the seeds. Discard skin. Remove rabbit from marinade and allow to come back to room temperature. Heat a barbecue, or chargrill pan, to medium heat. Brush rabbit with olive oil and season with salt and pepper. Cook the small legs for 6 – 8 minutes each side and larger legs and saddle pieces for 10 – 15 minutes, turning regularly and occasionally brushing with marinade.Transfer to a large tray, loosely cover with foil and set aside to rest for 10 minutes. 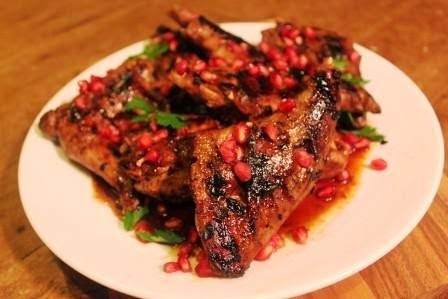 Arrange the rabbit on a serving plate, drizzle over some of the pomegranate glaze and sprinkle with pomegranate seeds. Serve with remaining glaze and a spinach salad. This was my post for this month's #LetsLunch, a monthly Twitter based food blogger's virtual lunch club. If you'd like to join the LetsLunch group, go to Twitter and post a message with the hashtag #LetsLunch or post a comment below! For more non-traditional festive recipes from the #letslunch blogger crew click on the links below. I'll continue to update them as they come in.